"Original and exciting. Full marks for Ms Cody." "Poverty-stricken Ethiopia and its inhabitants are the vivid setting for this provocative thriller that showcases Cody's deft, sparse literary style." "Fresh, original, and spellbinding... A winner." Care to guess who the model for this cover was? A rainy day on four flights of stairs in central Bath. "I was gripped... [Told] beautifully, touchingly, sometimes brutally..."
"Adventurous in form, sparklingly written and with every page more gripping than the last, this bluesy novel may well be the already garlanded Cody's best yet." And for the figure in this picture? Taken on the canal in Bath. 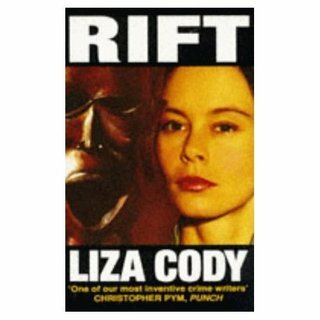 "Compelling... warm and amusing, written with the characteristic Cody honesty... a terrific read"
Rift is an adventure story about an ingenue called Fay Jassahn who travels up the Rift Valley from Kenya to Ethiopia and then doesn't know how to get home. It's based on a trip I made myself at a time of famine and revolution. All the places are real, as are a lot of the characters and some of the events. I should not have been there, because to witness events like those and yet be able to do nothing to help made me part of the problem. I thought about it for over 10 years before I dared write about it. But even after 10 years, the trip was, in memory, still so catastrophic that I needed to face it and try to make sense of the experience. I don't actually believe that writing a novel was the appropriate response, but it's the only skill I can use to remind people about other, godforsaken parts of the world where ordinary folk, just like you and me, endure or die in unbelievable suffering. Even as I write this - July 08 - the Horn of Africa is facing another catastrophe, provoked by climate, rising food prices, the cost of oil and the criminal neglect of bad or no government. It's the same stuff that makes you and me complain at the gas station or wince at the supermarket check-out. But the stuff that merely pisses us off actually kills them - kills their children and makes them watch their families die. Ballad of a Dead Nobody involves the efforts of a biographer to unravel the story of the live, and death, of Elly Astoria, a teenager with extraordinary musical abilities. As a little girl, Elly taught herself to play guitar and keyboard so that she could feed herself and her mother. One rainy night she was spotted singing and playing by the founder of an indy women's band. Later, cleaned up and better fed, she caught the eye of her future manager - and his creepy sister. It should have been a rags to riches story. Instead Elly's career was cut short by her perverted and grisly murder. Years after her death it looks as if Elly's life has been overlooked. If anyone deserves rediscovery and biographer, it's her. Clearly there's a story to be told and a mystery to be solved. But how? Miss Terry is about Nita Tehri, who seems to have her life sorted. She has a good job she likes, she lives in a pretty apartment in a quiet street and she has escaped from the family who endangered her. Yet despite everything she's achieved, she still has a problem. She doesn't look like her neighbours. And when a grisly discovery is made outside her door, all eyes turn her way. She's done nothing wrong. But slowly, inexorably, her life turns inside-out. How can people she used to think of as her friends and colleagues behave so irrationally in modern, enlightened England? Little by little her faith in society and British justice is ended. It isn't only her belief in fair play that's threatened. One thing is certain - if she survives, her life will never be the same.